Flux Power Holdings Inc (OTCMKTS:FLUX) has several recent catalysts to send the share price much higher than its current levels. The stock currently trades at $0.045 and traded 10 times higher in 2014 at $0.40. 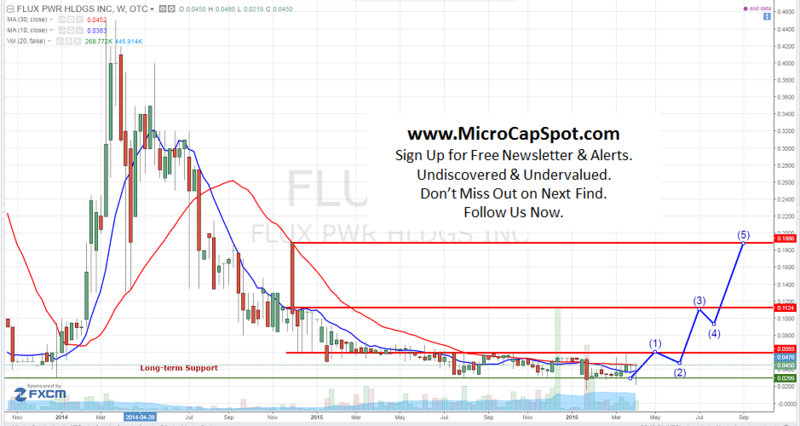 FLUX has been stuck in a tight trading range over the last year and could be attempting to breakout. FLUX added two directors to its senior executive management. It appointed Steve Dickson as director of sales and Jon Berry as director of operations. Both have extensive background alternative energy technology experience across a range of industrial and commercial applications. They will guide Flux Power Holdings Inc (OTCMKTS:FLUX) as it transitions into active sales, marketing and commercial production of its UL 2271-listed lithium-ion LiFT Pack batteries for walkie pallet jack forklifts. Flux’s LiFT Pack is a solution designed for walkie pallet jack forklifts. These forklifts are widely used in warehouses and depots, on trucks and at retail locations. An estimated 120,000 electric walkie pallet jacks are currently in use in North America. Majority of these are powered by decades-old lead-acid battery technology. This equipment provides a potential total available market of almost $400 million for a portion of Class III lift equipment. UL 2271 Listing complements Flux’s proven performance and total cost of ownership advantages by providing a widely recognized validation of the safety and durability of its LiFT Pack line. Ron Dutt, the CEO of FLUX, commented, “Today’s appointments substantially enhance the strength of the Flux team as we prepare to launch and scale-up production and sales of our recently UL 2271-Listed Flux LiFT Pack battery solutions. We have spent the past two years developing rugged, high-performing solutions, introducing and piloting the concept of a better performing, lower cost alternative to lead-acid batteries which have long dominated the industrial market. Those efforts helped us build strong relationships with distributors, dealers, lift equipment OEMS and importantly, customers that include some the world’s leading beverage, food, grocery and distribution companies. According to a recent 10-K filing, the company received financing of $2.25 million from Esenjay (including $275,000 subsequent to December 31, 2015) under our Unrestricted Line of Credit. The outstanding principal balance of $1,850,000 with a remaining available balance of $650,000 under its Unrestricted Line of Credit. Esenjay has the option to convert any or all of the amount outstanding, as well as, any future borrowings under the Unrestricted Line of Credit into shares of FLUX common stock at a conversion price of $0.06 per share until July 30, 2016. Flux Power has identified a large, addressable market, namely the $1.5 billion motive power battery industry in North America. Flux Power’s main product targets mostly the Class III trucks, whose population has been consistently growing since 2010 with an estimated total of over 230,000 trucks in use today based on data from the Industrial Truck Association. The Company also recognizes that they have the resources to target other market segments in the future such as Robotics, Airline Tug and Tow, and Portable Military applications. Beginning in early 2014, the Company secured important relationships with major forklift manufacturers, like Toyota, and now have approval from Toyota to place Flux LiFT Packs in their Class III lift trucks, both for new trucks and as a replacement option for existing trucks. FLUX is currently trading at a $9 million market valuation. The company is poised to hit an inflection point similar to PLUG with its turnkey solution. There is a huge available market and old forklifts that needed updating which is cheaper to take FLUX’s solution than purchasing new equipment. We will be updating on FLUX when more details emerge so make sure you are subscribed to Microcapspot so you know what’s going on with FLUX. Disclosure: we hold no position in FLUX either long or short at the publication of this article.